The damage done by discharged wastewater treatment effluent to the environment is a function of its organic loading because organic molecule decomposition consumes the DO of the receiving waters. BOD analysis measures all molecules that exert an oxygen demand, however it is slow, and readings vary depending on the bioassay used. 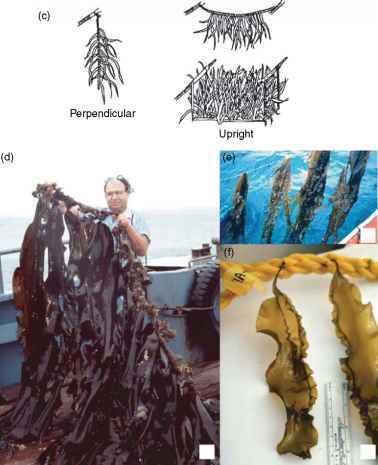 COD analysis is faster but is affected by variations in chemical oxidation efficiencies. Carbon analyzers (TC and TOC) further increase speed but do not detect the load represented by nitrogen-based molecules. A direct correlation between BOD, COD, and TOC is not possible. Yet, TOC provides a rapid and reasonably accurate indication of pollution levels. To determine the TOC content of a sample, an environmental engineer must use one of two techniques to eliminate the TIC usually present but of little or no interest to the TOC analysis. The TIC in a water sample is usually in the form of inorganic bicarbonates and carbonates. One technique analyzes these components independently and then subtracts them from the TC. The TOC is then determined by the difference between TC and TIC (TC — TIC = TOC). The other technique acidifies the sample to a pH of 2 to 3 followed by a brief gas sparging to drive off the carbon dioxide formed by the acidification. Any carbon remaining after the sparging should be TOC. Thus, the TC in the sparged sample is equal to the TOC content of the sample. A weakness in this technique is the possible loss of some VOCs that may be in the sample. Further techniques can account for these VOCs. 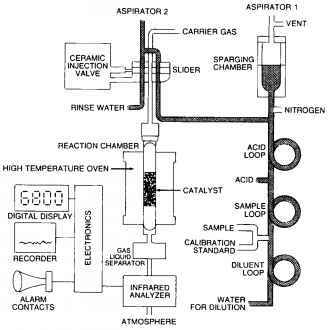 The TOC method was introduced in 1964 as a singlechannel TC analyzer using a catalytic oxidation combustion technique followed by analysis of the resulting carbon dioxide. This method removed inorganic carbon (IC) by acid sparging or determined its concentration by titration. A few years later a second channel was added to the method that permitted parallel determination of IC in a second heated-reaction chamber. Several other techniques have since appeared with various changes in methodology and detection. Because of the rapid acceptance and usefulness of TOC analysis as a laboratory method, online TOC analyzers became available in the late 1960s. Their success was limited by the relative complexity of these continuous analyzers. Today, there are a half dozen distinctly different methodologies and means of detection for TOC analysis. pling system is left off, the analyzer becomes a TC analyzer. If a second, low-temperature reaction chamber is added in parallel with the one shown, the analyzer becomes a TOC differential analyzer. The cycle time of this instrument is 2.5 min in the TC mode and 6 min in the TOC mode. It can operate unattended indoors or outdoors in an analyzer house. It can handle samples with solids content to 1000 ppm and particle sizes to 200 / because an automatic water rinse is applied after each measurement cycle. The design of the ceramic injection valve guarantees the accuracy of the sample size. The calibration of the instrument is automatically checked each time a known standard is introduced. During autocalibration, the analyzer runs three consecutive calibration standards, averages the results, and adjusts instrument calibration within preset limits or activates an alarm. The analyzer also has a dilution and automatic range change capability for concentrations that exceed the operating range. Carrier gas (nitrogen) consumption is 100 cc/min at 50 psig (3.5 bars), while acid consumption in the TOC mode is about 1.0 gal (3.8 l) per month.